Earlier this month, Gearbox teased what looked to be either another Bulletstorm re-release or a new Duke Nukem game. The actual announcement from today's PAX stream landed somewhere in the middle: Bulletstorm is coming to Switch and Duke Nukem's tagging along for the ride. "Since the first reveal, when I saw the capabilities of the latest Nintendo console, I knew that we need to get Bulletstorm working on that thing!" said People Can Fly CEO Sebastian Wojciechowski. "The whole team was super pumped up on doing that." 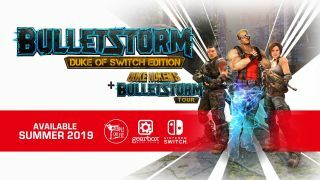 The headliner for the Bulletstorm: Duke of Switch Edition is the Duke Nukem DLC which adds an optional skin and voice pack that turns you into Duke. It also includes the other DLCs released for the Full Clip Edition, most notably Blood Symphony and Gun Sonata. Those are a little more expansive - and, for my money, interesting - than Duke's appearance, but the main draw is still the core game. Bulletstorm is just a fun FPS, and its creative skillshot system, which challenges you to rack up combos by chaining ridiculous stunts and finishers, has aged well. The Duke of Switch Edition will be out this summer. Gearbox hasn't nailed down a price, but given Bulletstorm's history, I'd bet on $40. The original version of the game was pulled from stores following the release of the Full Clip Edition, and that version still goes for $40. The entire point of Gearbox's PAX event was, of course, the Borderlands 3 trailer, which we've dutifully picked apart to form this Borderlands 3 trailer breakdown complete with 36 essential factoids.